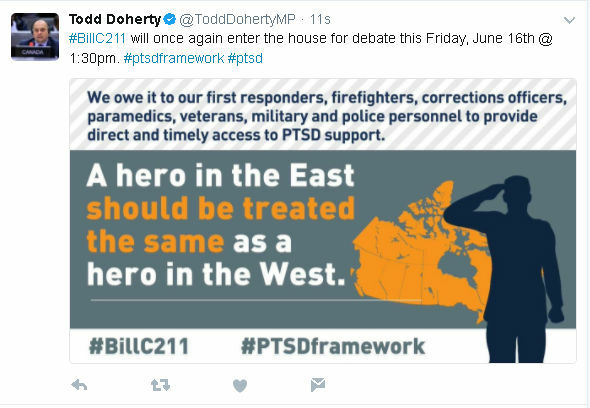 Ottawa, ON – Cariboo-Prince George Conservative MP Todd Doherty is hoping his private members bill –Bill C211 – will take another step forward tomorrow. The bill is up for third reading and aims to provide a national framework with respect to post-traumatic stress disorder. “It’s a big deal, it would mean that those families that have been seeking answers, have been seeking help, will hopefully be able to get it,” says Doherty. He’s expecting the House of Commons gallery will be packed to the rafters with support like it was during second reading of the bill earlier this year. Doherty says he’s “cautiously optimistic” it will receive unanimous support before being sent to the Senate for a review and ultimately Royal Assent. Appropriate timing for the bill as June is Post-Traumatic Stress Disorder Month in Canada. According to the U.S.- based National Centre for PTSD, about seven or eight out of 100 people will experience PTSD at some point in their lives. « Previous story: Fire On MacDonald Ave.
Much as I have no like for Todd I will give him kudos for this. Tell the boys to stay off pills when serving in a foreign country would improver their health. Twelve years in Afghanistan and 150 casualties wonder what they were doing. We had 517 casualty’s in Korea in the three years we were there. Way to go Todd, Thank you for all that you do. Awesome! If it isn’t passed there is serious consideration that politicians don’t really care as it should be a given! It is needed!